Koo Kwang-mo, the son of LG Group's late Chairman Koo Bon-moo, became a board member of the holding firm and its CEO on Friday, effectively becoming the fourth-generation leader of the family-controlled conglomerate. Koo, who was adopted by the late business tycoon so as to fulfill the LG family's tradition of handing over power to the chairman's eldest son, was named as the newest board member during Friday's shareholders' meeting of LG Corp. He was tapped by the board as CEO later in the day. Koo currently holds a 6.24 percent stake in the holding firm. When he inherits the 11.28-percent stake of his late father, he will become the top shareholder. Koo Bon-joon, who is a younger brother of the late tycoon, currently holds a 7.72-percent stake. "I plan to succeed and develop the assets of LG, which are creating value for consumers, respecting people, and carrying out morally correct management," Koo said in a statement. "If there are any areas that need change, I plan to improve them, and make every effort to establish grounds for growth over the long run." Koo will jointly lead the holding firm with LG Vice Chairman Ha Hyun-hwoi. The appointment marks the first time that a great-grandchild of the founder will head one of South Korea's top 10 conglomerates. LG Group, which holds various globally known affiliates under its wing, including LG Electronics Inc. and LG Chem Ltd., is considered the country's No. 4 business group. Koo Bon-moo died in May at the age of 73, after undergoing brain surgery several times earlier this year, leaving behind two daughters and Kwang-mo, who was adopted from the late tycoon's younger brother Koo Bon-neung. The heir studied at the Rochester Institute of Technology and joined LG Group by starting his career at the financial division of LG Electronics Inc. in 2006. He also worked at the U.S. arm of LG Electronics and its Changwon-based production line in southeastern South Korea. Industry watchers said Koo is expected to focus efforts on fostering LG's artificial intelligence, the Internet-of-Things and robot businesses as he begins a full-fledged role as the group's leader. LG said the young Koo will focus on preparing for the future, investing in human resources, along with what it calls "morally-correct management." The conglomerate added Koo will work closely with CEOs of its affiliates, and allocate significant time to preparing for the future. 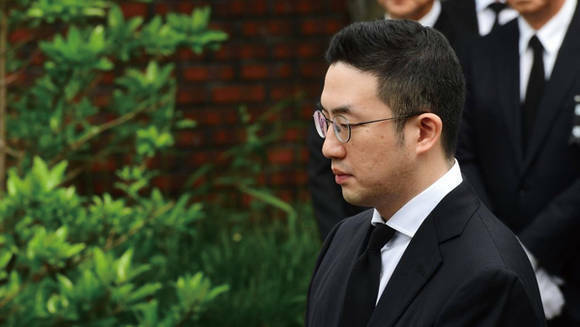 LG described Koo as a "practical" person, claiming that Koo inherited humility, solicitude, and principle from his father. Koo Bon-joon, meanwhile, has decided to leave LG Group later this year, apparently also in line with the family tradition. Industry watchers said the new CEO's uncle may seek to spin-off affiliates of LG Group by utilizing his shares in the holding company. The value of his shares is estimated at around 1 trillion won (US$893 million). Koo Bon-joon in the past worked at LG Display Co., LG International Corp. and LG Electronics Inc.
Others, however, said he may refrain from taking away key affiliates as such a step can adversely impact the conglomerate as a whole and hurt its overall competitiveness. Instead, considering his interest in technology, he may opt to acquire such firms as LG CNS, LG Innotek Co. and Silicon Works Co.
Kim Sang-hun, who formerly led South Korea's top portal operator Naver Corp., was also named a non-executive director by shareholders.